Backward channel built in module; preset attenuator and equalizer; optimal interstage tilt; models with changeable effective gain and interstage tilt; built in splitters and shifters at the input and output; two outputs using replacement insert (demultiplier and shifters); all models up to 862 MHz. two outputs using replacement insert (demultiplier and shifters) all models up to 862 MHz. * - Distant feed model. ** - Local supply model. *** - changeable equalizer, interval 2.5 dB. Made to order, the first value of diplexing filter band is added to the model of backward channel pulley, for example, DXR 208 30. DTU 121- shifter 1/12 dB. Can be set before and after the amplifying stage. If set before the amplifying stage they act as passive main elements of cable network. 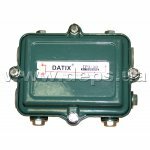 Trunk taps DATIX are designed for splitting a TV signal in the range of 5…1000 MHz into 2 (3) directions. The taps are placed in a hermetically sealed case to be installed outdoors. A self-centering clip ensures reliable fixture when used in overhead transmission lines and in vertical structures without recourse to buying angular adaptors. Totally hermetically sealed moulded cases ensure service life of components and electromagnetic protection. Trunk 5/8" connectors with plated surfaces are excellently protected against corrosion and other harmful environmental effects. 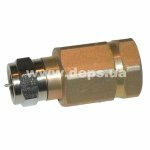 The connectors are designed for passing heavy supply currents. Inside the case, there is a plastic cover to protect the electronic card against casual damage to its components. It is used to infeed power supply to the main/trunk cable. Totally enclosed moulded cases ensure service life and electromagnetic protection. Ports for the infeed of supply voltage and ports for connecting a coaxial line are furnished with 5/8" connectors. Cable adapter for connection of a trunk cable equipped with a 5/8” connector for amplifiers or dividers with the F-type connectors. 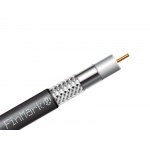 Adaptor housing is made of aluminum alloy, captive nut – nickel coated brass.